The representation of the people of Western Sahara has lodged complaint against the banks BNP Paribas, Société Générale, Crédit Agricole, the insurance company Axa Assurance, airline Transavia and tourist agency UCPA over the accusation of colonisation. The Western Sahara national liberation movement Front Poliario has initiated legal cases against six French companies for alleged crime of colonisation - which is classified as war crimes under French law. The six companies are the tree large bank groups BNP Paribas, Société Générale, Crédit Agricole, the insurance company Axa Assurance, airline Transavia and tourist agency UCPA. The three banks have subsidiaries - BMCI, Crédit du Maroc and Société Générale Maroc - that have opened up branches in the part of Western Sahara that is under Moroccan occupation. AXA Assurance has done the same through its fully owned Moroccan subsidiary AXA Assurance Maroc. The two other companies are the French-Dutch air company Transavia, who last year opened up an airline connecting Paris to Dakhla, Western Sahara, and UCPA, a French holiday agency that organises vacations in Dakhla. The cases have been initiated with the State Prosecutor at the High Court in Paris on 18 October 2018, on the basis of article 461-26 of the French penal code: the crime of colonisation. Just a month ago, Polisario took Breton-based fish canning group Chancerelle (Connétable brand) to court. Chancerelle processes fish caught in occupied Western Sahara in its factory in Agadir. The company has agreements for the supply of fish with 27 Moroccan fishing vessels that fish in Western Sahara. Chancerelle had also announced it would invest 4 million Euro to construct a 4000m² fish processing plant in "Laayoune, in southern Morocco". The complaint was reported by French daily l'Ouest France last week. UPDATE, 24.10.2018. WSRW has obtained a working document (neither formal nor submitted) made by Polisario's legal team. 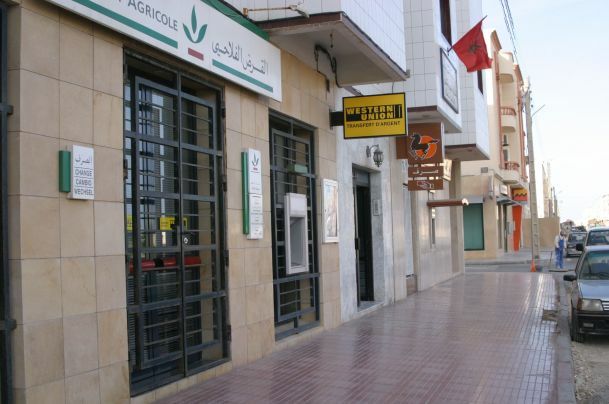 Photo below shows the banking street in El Aaiun, as of 2006, with local offices of Credit Agricole, Western Union, Banque Populaire du Maroc and Attijariwafa Bank.